​Access to safe, clean, drinking water is something that is vital to the health and well-being of our communities. The Walkerton tragedy, in which thousands fell ill and seven people died, showed us how vulnerable drinking water can be when it is not managed properly. The resulting Walkerton Report made recommendations for improved management of Ontario drinking water. A part of these recommendations emphasized the need for ensuring that water is protected at its source and that managing source water protection was done on a watershed basis. In 2006, the Clean Water Act was implemented as a result of these recommendations. The Act helps ensure that our communities are able to protect their municipal drinking water supplies from contamination and overuse. It uses a multi-barrier approach that stops contaminants from entering sources of drinking water and subsequent water treatment. Conservation Authorities have a strong track record of partnering with municipal, provincial and federal governments in developing practical solutions to watershed issues. They are recognized for their watershed management knowledge and connections to local communities. They are also used to working on a watershed basis, across municipal boundaries. For these reasons, Conservation Authorities have been designated as the lead agencies in developing Source Water Protection plans. Source water is untreated water from lakes, streams, or underground aquifers used to supply drinking water systems. Source Water Protection is simply protecting source water from contamination, by pathogens or chemicals, or overuse. This will ensure that there is enough safe water for all designated uses - now and in the future. The Conservation Authority's role is to coordinate source water protection planning across the watershed. It provides support to local municipalities, and ensures that municipal strategies are integrated into larger watershed plans. 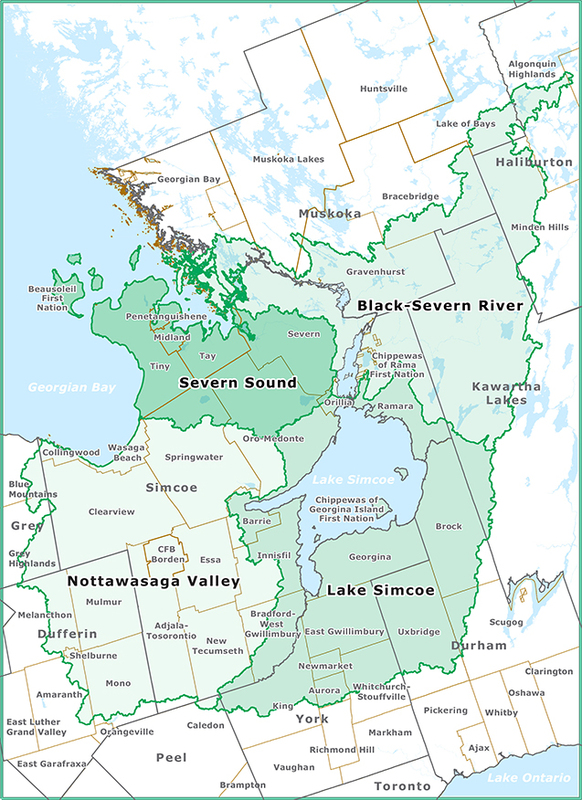 The NVCA is a partner in the South Georgian Bay Lake Simcoe Source Protection Region. This is one of 19 Source Protection Regions throughout Ontario. This region contains four watersheds and spans over 10,000 km2, from the Oak Ridges Moraine in the south to the Canadian Shield in the north. It contains 52 municipalities, three First Nations communities, 291 municipal supply wells, and 16 municipal surface water intakes. Source protection planning and implementation is all about protecting existing and future sources of drinking water. The Source Protection Plan for the South Georgian Bay Lake Simcoe Source Protection Region sets out actions to address contamination threats to the lakes, rivers and underground aquifers that supply water to the municipal drinking water systems in our area. It received approval from the Ministry of Environment and Climate Change on January 29, 2015. It takes effect on July 1, 2015. The plan was the result of many years' work and public consultation. This Source Protection Committee was one of 19 committees established through the Clean Water Act. Each Committee assessed potential risks to local water supplies. Members then led local discussions with municipal partners about the best way to address these risks, using the input to develop a source protection plan. Advice was sought from sector experts throughout the plan development. The committee in this region consists of a chair and 22 members speaking for the local interests of the region (municipal, public, health, business, agriculture). Rama First Nations participated in the development of the plan, and their drinking water intake is included within the plan. Community engagement was very important to the plan's development, and the committee consulted with the public throughout the entire process. The policies in the Source Protection Plan protect the lakes, rivers and underground aquifers that supply water to municipal drinking water systems. The plan outlines actions to protect our region's 16 municipal intake systems and 277 municipal well systems. The Source Protection Plan for the South Georgian Bay Lake Simcoe Source Protection Region is available at ourwatershed.ca. If you require the plan in an alternative format, please contact the NVCA office. How serious are the risks to my drinking water supply? The plan calls for actions to manage or restrict these activities.